After the flood, the earth was repopulated. But problems developed again, and people left serving God to do “things their way” … Men departing from God’s way built cities and developed empires (Babel, Genesis 11:9; 10:10), seeking to “ make us a name” (Gen 11:6). God thwarted their purpose by confounding their language. He decided to work through one man (Abraham), one family, and ultimately one nation, to bring about His purpose. Abraham is VERY important in the purpose of God. God tells us what He thinks of him in Genesis 18:19. He was a man who had the capacity to “keep the way of the Lord” and pass it on. Abraham is mentioned 74 times in the New Testament. 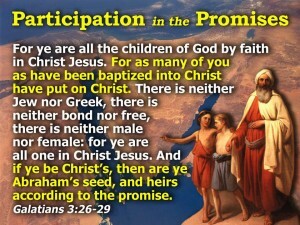 The promises made to him form the basis of the Gospel. (It is not possible to understand the gospel without Abraham). Genesis 11:27-32 Abraham lived in a sophisticated civilisation. “Ur of the Chaldees” was a city of culture and learning, also a centre of idolatrous worship (Joshua 24:2-3). The temple or ziggurat of Ur is one of the best preserved ancient monuments in Iraq today, (Tell al-Muqqyyar). Abraham received a message from God to leave. This is recorded in Acts 7:2. He and his family moved to Haran – 800 miles north-west. These promises remain unfulfilled (Hebrews 11:13). Though a wealthy man, Abraham continued to live in tents as a mark of his pilgrimage. He did not endeavour to “put down his roots” as it were, because “he looked for a city .. whose builder and maker is God”. (Hebrews 11:10) Abraham, like others who are recorded in Hebrews 11, will receive the promise in the future (Hebrews 11:39,40). The seven words of the international promise (“In thee shall all nations be blessed”) constitute the gospel : Galatians 3:8. They show that God intended ultimately to bring blessings to ALL PEOPLES. In Genesis 13:14-17, the LAND is promised to Abraham. Genesis 15:18-21 – the boundaries of the land are defined. God makes a covenant (more sure than a promise). Genesis 22:16-18 – Promises and covenants are conditional. This time, God guarantees the promises – on the basis of His own existence. Hebrews 6:13-18 states that the promise is now “immutable” – unchangeable. “thy seed” is no longer the nation of Israel – the singular pronoun “his” defines the seed as singular. Paul interprets this as Christ. Galatians 3:16. 8. There is only one way we can inherit – we must belong to the family of Abraham, THROUGH BAPTISM INTO CHRIST. (Galatians 3:27-29). Next Lesson: The Establishment of the Kingdom of God – how God chose the small nation of Israel to live under His laws.